Thread: RU, UA and BY fashion, style and traditional clothing! BUT; is there anywhere where people still dress in traditional clothes every day? Why do so many rural women always wear a scarf? What do you consider to be typically Russian style of clothing today? When I was a kid, there was a big fashion for "Ukranian peasant blouses " as they were called. Cotton blouses with lots of embroidery on them. I had some tops and dresses in that style - super cute! Also lots of women used to wear what we called "Russian scarves" in the winter, basically a very large woollen scarf with colourful flowers against a white or black background. Looks pretty good with a plain coat. You can still see this look a fair bit. The people who dress this way usually also wear a type of traditional boots that the Sami people make. That's all I can think of really... Other than fur hats on men, but I am not sure if that's typically Russian. So how to dress like a Ukranian or a Russian person? Re: RU, UA and BY fashion, style and traditional clothing! Great idea for a thread, Johanna! Traditional clothing is reserved for special festivals. No one wears it now, of course. Though some women do wear the scarves you describe -- I think they're rather shawls than scarves (in Russian they are called "платок" or "шаль"). They had various forms. I'd say the "C" variant is the prettiest and most recognisable. Kosovorotka/КосоворОтка (a skewed-collared shirt. The word is derived from "косо" -- askew, and "ворот" -- collar). Lapti/лАпти (sing. -- лАпоть) -- a type of footwear made of bast (= the bark of linden tree or birch tree). Valenki/вАленки (sing. -- вАленок) -- still worn though you're not likely to see them on younger people -- maybe on old men/women and children; I believe we still have a pair at home. There is also a fashion trend to make "fancy" valenki with all sorts of decorations. Ushanka/ушАнка (from "ухо/уши" -- "ear/ears"). Telogreika/ТелогрЕйка (literally "body warmer": from "тело" -- body and "греть" -- to warm) -- a type of winter uniform first issued by the Red Army during the Great Patriotic War. It is a quilted jacket sewn of cotton fabric with a cotton wool batting inside. 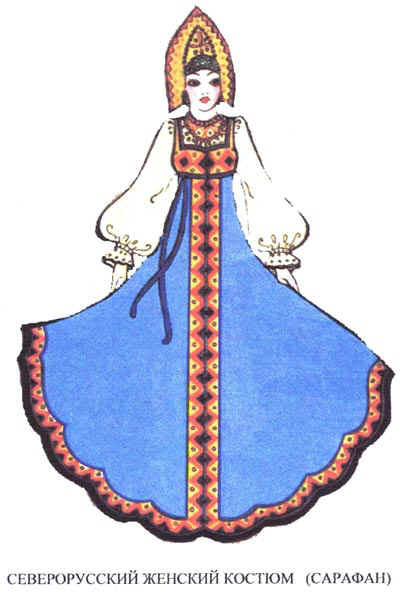 It is also known as "vatnik"/"вАтник" (from "вата" -- cotton wool) and "fufaika"/"фуфАйка" (though "vatnik" is supposed to be sleeveless like a waistcoat). Not a partiularly glamorous type of clothing as it's associated with prison and convicts. Phew, well, that would be all the basics. These are amazing pictures! Thanks Starrysky! I have actually MADE a pair of "valenki" boots, in school, Textiles/Handicraft subject. (not sure what this is called in English). I didn't know it was a Russian technique! It was complicated but fun to make them. The ones I made were not very good looking but incredibly warm. Some of the traditional Russian fashion almost looks a bit Eastern/Asian. It is very impressive that Russia is so large that it borders both China and..... Finland! For example the padded jackets of the female partisans look like clothing that Chinese people use. I can't remember having seen that style anywhere else. You are right about the word shawl. I would use it too, but English people never use this word - I simply never hear it. Everything that you wrap around the head or neck seems to be called scarf. My mother had shawls just like the ones from the picture. She used to wear them with a black mink coat. It must have been fashionable back in the 1980s I guess. I googled the words from your post and came to the site of Gleb Ushkin: He has some really beautiful pictures. The costumes from the films are amazing! For some reason that I have forgotten, I had a set of about ten or so Russian souvenir dolls as a kid. and some of them were dressed in these types of clothes. When I was watching the TV series "Колдовская Любовь" I noticed that the people dressed in what I would consider to be a very old-fashioned type of way, even though the film was supposed to take place in modern times. The grandmother of Zhenia who had the lead role, dressed only in black with a tight scarf, a bit like a nun. All the women are wearing dresses, aprons and headscarves. Several of the men are wearing an old style of dress too, but it is not as noticeable. Either the film is misleading, or the rural people in some parts pf Russia dress in a very traditional way. I have only visited one place in Russia and that is St Petersburg, and it was quite a long time ago. In fact almost everything about the series had a 1930s look to it... I was quite surprised at that. I had a really hard time following the series though. I couldn't understand enough of the dialogue and there are no subtitles in any language. Great pics, Johanna! It's interesting to see how the costume varied by regions. 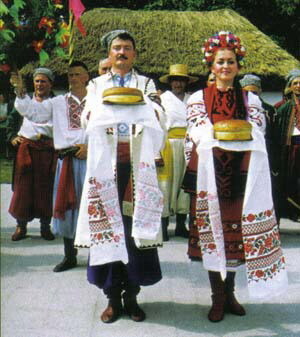 Ukrainian national costume is very distinct and specific. For women it is a white embroidered blouse, a knee-length skirt and a flower wreath with very long colourful ribbons. And kneehigh red boots. 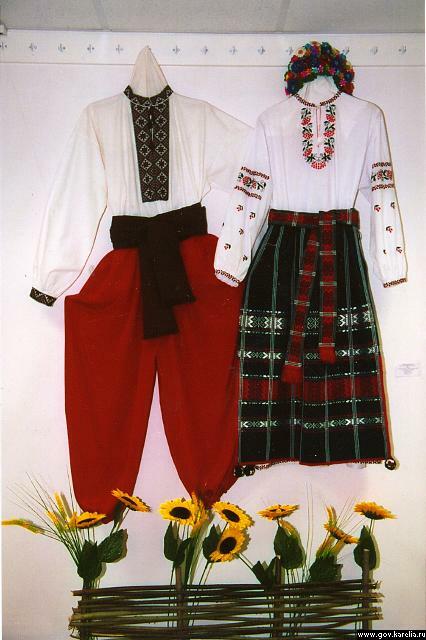 For men, it's a white embroidered shirt and very wide (red) trousers called "шаровАры" with a wide belt/sash. I am a huge fan of folk dances esp. as they're performed in national costumes, so I very much recommend this thread http://www.indiandance.biz/viewtopic...83417732fd4d03. It has got a lot of nice pictures of Russian and Ukrainian dances. The other ensemble was founded by Igor Moiseyev. Here's its official site http://www.moiseyev.ru/. This ensemble dances all sorts of folk dances, not only Russian, whereas "Берёзка" is mostly Russian. Back to national costumes and looks -- Ukrainian men's hairstyles also deserve a mentioning, I think, as they were very peculiar. It was either a sort of pudding-basin haircut or a completely bald head with a thin braid/plait left and maybe a fringe (called not "чёлка", which is the Russian translation for "fringe/bangs" but "чуб"). This last hairstyle was particulalrly characteristic of a region called "Запорожская Сечь" where "Запорожские казаки" lived. There's a very famous painting by Ilya Repin called "Запорожцы" or "Запорожцы пишут письмо турецкому султану" -- "Reply of the Zaporozhian Cossacks to Sultan Mehmed IV of the Ottoman Empire", 1880-91. These are from the film "Вечера на хуторе близ Диканьки. Ночь перед Рождеством"
Wow Starrysky you've outdone yourself, these pictures are fantastic. The Ukrainian costumes are sooooo nice. I just can't resist those embroidered blouses.